Welcome to the site of Kristin Kirby, writer. If you love hard-hitting podcasts, you should check out Parcast network. Parcast does scripted podcasts on a variety of intense subjects like Haunted Places, Unexplained Mysteries, Unsolved Murders, Historical Figures, Assassinations, Kingpins, and more. The first episode of the first podcast I wrote for Parcast premiered today. I’m so excited! It’s for their show Conspiracy Theories, and it’s about “FEMA Death Camps.” Part two will air next week. Consummate actors Molly Brandenburg and Carter Roy narrate, and they are awesome. Here’s the link to Conspiracy Theories: https://www.parcast.com/conspiracy. Episodes I wrote for the show Female Criminals will be coming along soon! In 2001, I fulfilled a dream and traveled to Africa. Our small group toured Namibia by Land Rover, visiting wildlife reserves, massive orange dunes, arid diamond fields, and quaint coastal towns. Later we would stay at a camp in Zimbabwe and ride elephants and stand in the spray of Victoria Falls, but those first hypnotic days on the open road gazing at the Namibian landscape, with giraffes clubbing among the camelthorns or pale chanting goshawks soaring like ghosts above the savanna or a lone hyena step-and-hitching parallel to our truck for miles, remain with me even now. I got to take the controls of a Cessna on that trip. We went for a twilight boat ride down the Zambezi among a herd of hippos. One day we saw flamingoes in the morning and penguins in the afternoon. But my favorite memory of Africa was the evening spent at a ghost town out in the Namib Desert called Kolmanskop. The little German village, built in 1908 for diamond miners and their families, was abandoned in 1954. In the years since, the desert has been slowly reclaiming its own, swallowing homes, the hospital, school, ballroom, and other buildings. The glass in most windows is gone, doorways are filled almost completely with sand, wood floors are rotting, and plaster is cracking and turning to powder in the relentless heat and wind. Our group was allowed free run of the place, our guides promising to pick us up after a few hours. We explored the dusty grounds and crumbling buildings, taking photos and marveling at how grand the town must have been in its heyday, yet how remote. I was fascinated with the rooms filled so high with sand, nervous as I crawled through a cramped doorway, thinking about cave-ins. As dusk fell, my friends headed outside to wait for our guides. I wanted to stay longer, absorb more of the atmosphere. In the mayor’s house, I carefully made my way up creaky stairs to the second floor. The floorboards were broken through in many places; in the dimming light, I could see the first floor below. At a window, I waved to the others outside. The sudden surge of loneliness, foreboding, and menace hit me like a hard wind. My skin prickled. I was aware of a presence on that second floor. 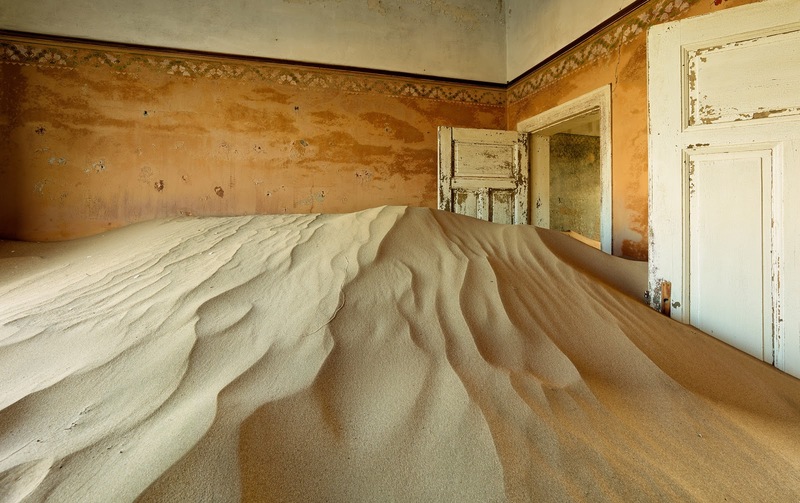 Whoever—whatever—still lived in the shifting sands and empty rooms of Kolmanskop was fine with visitors during the day. But when night came, this place belonged to them, and they didn’t want me there. I was afraid to turn from the window, to see who was sending me such hateful feelings. But it was getting darker by the minute. I said it out loud, emphatic: “I’m leaving. Thank you. Be well. I wish you well.” My eyes wide in the dark, I shuffled past the gaps in the floor and stepped cautiously down the stairs and out to the yard. And took a shaky breath before joining the group. I wanted to share clips of my friend Terese’s work. She’s making a stop-motion movie of one of my short screenplays. Here are a couple of “screen tests” of the main characters. Jeff came in from his studio last night carrying an old doll’s head and a rusty piece of iron welded to four wooden casters and declared, “I’m running out of junk. I need to get more.” The lighting piece in this photo is made from junk, er, found objects, including part of a vintage boat motor Jeff found in the park where we run. One person’s trash is another person’s treasure, and all that. It’s all about perspective. I’m big on perspective. Everything is perspective. Its archaic definition is “an optical glass, a telescope.” That’s definitely different from the naked, unadulterated eye. Even nowadays it can mean both an actual, physical view or a mental one, outside or in. Then there’s the visual artist’s definition as it relates to giving the illusion of depth and distance. A hundred people can look at the Mona Lisa and each have a different opinion. What’s that fable about the six blind people describing the elephant? The one touching the trunk says an elephant is like a rope. The one touching the belly says it’s like a wall. The one touching the tusk says it’s like a pipe. And so on. Some people think THE BABADOOK was great; I think it needed 10 more minutes of scary to make it ascend into awesomeness. As a writer, I can look at what I’ve put on the computer screen and see it differently than what’s on the page out of the printer. I can look out at the rain and be glad it’s watering my flowers. An hour later I can be frustrated because I want to get out and weed said flowers and not get wet. Perspective. Age changes perspective. So does time. Space. Information. Education. Wealth or poverty. It’s relative, right? I’m reading Slaughterhouse Five again. Haven’t read it since I was in my 20s. I know my perspective is going to be different now. I love that. It makes life so interesting. Everything is perspective. And dare I say it, perspective is everything.